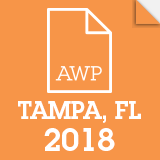 After the 2017 AWP Conference in Washington D.C. (AWP is the Association of Writers and Writing Programs and holds an annual conference in a different city each year), I vowed I would not be attending the 2018 Conference in Tampa. There were several reasons for that decision. First, I had no interest in visiting Tampa. It’s not particular easy to get to from where I live in rural Virginia, and Florida does nothing for me as a destination (I get enough sunshine at home in the summer). Second, the conference itself is problematic on several levels. It’s expensive (registration, airfare, hotel, meals—it adds up to a hefty sum if you are an independent writer without institutional funding). Presentations are of disparate and unpredictable quality. It has become something of a young-writers’ gathering, and I have felt increasingly out of place in recent years. Plus, efforts to improve the organization’s gender diversity record have resulted in a conference that is dominated by women (a significant majority of presenters are women—nearly two-thirds). There may be good reasons for all of these developments, but it makes the conference feel less relevant to me. And third, I did not have a book come out in the past year, so I had no new publications to sell at the book fair. But as the deadline for registration (not to mention travel and hotel reservations) grew closer, I felt my resolve slipping. Many friends made plans to go and urged me to come. Press 53, publisher of my two books and two anthologies, expected to have a large presence, including almost 30 of its authors. And I realized that it might be valuable to touch base with some of the small presses in attendance to stir some interest in a completed novel manuscript that needs a publisher. There is nothing like the AWP Bookfair for making those connections—800 exhibitors ranging from tiny magazines to large publishers all in one football-field-sized space. In the end, I changed my mind and decided to go. This, then, is my report of my AWP experience and a few lessons learned. Travel/Hotel. Book early. Because I waited too long, my best flight option was to fly from Roanoke VA to Chicago to Tampa. (One blessing is that I used frequent flier miles, so at least it didn’t cost anything.) Because my flight out of ROA left at 6:23 am, I had to leave home at 3:30 am. That was no fun. I have no idea how one gets to Portland OR (site of AWP 2019) from here, but I’ll definitely book the trip earlier than I did for this year. And my hotel was pretty funky. It didn’t bother me much that it was a mile away from the convention center—I love to walk, especially when the temperatures are mild—but being closer is potentially convenient and better. I’ll try to book the main hotel for next year. Panels. I didn’t attend as many panels as I thought I might, but the ones I did go to were pretty good. Like many writers of literary fiction, I’m torn between plot—which I struggle with—and style. So I attended several panels on structure and plot and one on style, and I think I learned a few things, although I’m still torn. Plot is important—readers expect something to happen—but sentences are just as important. So I got something out of the panels I attended. However, looking at the schedule of panels, I was astounded by the number of panels that were made up entirely of women. And I’m not talking about subjects that are only of interest to women, whatever those might be. I would have thought that AWP would want to see diversity on its panels, but only 31% of panelists this year were male, down from 33% the year before. As noted above, maybe there are good reasons for this imbalance, but if the goal is equality then we’ve taken a wrong turn, in my estimation. Because panelists get some advantages—discounted registration and early access to conference hotel reservations—I have resolved to participate in panel proposals for 2019, against the apparent odds. Offsite Events. At AWP, there are the regular panels and the sanctioned evening events, like the keynote address (this year delivered by George Saunders). For some people—perhaps the people who didn’t have panel proposals accepted?—the “offsite” events are just as important. I usually stick pretty close to the main events, but this year I ventured out and attended a few things, such as an Authors’ Guild party and a reading at an Irish pub by alums of the Indiana University MFA program. (I didn’t get my MFA there, but I did get an MA in English there, plus one of the readers has contributed a story to the anthology I’m editing and I wanted to meet her.) Another event I wanted to attend resulted in a rather bizarre evening. I made my way in the rain to the venue listed in the program, a wine bar several blocks north of the convention center. It was loud and busy and no one there knew about the reading. Puzzled, I paced on the sidewalk outside wondering what to do. I was sure I had the right place, although the program listing mentioned a second floor space, and this wine bar clearly did not have a second floor. Just as I was about to give up, a manager came out and told me that she didn’t know what the mix up had been, but the reading had moved to another location, and she named a bar. As it happened, I’d seen that bar in my walks between my hotel and the convention center, so I knew where it was. I got there, ordered a drink, and waited. Eventually, the event organizers arrived and started to get things set up with the management, except that it became clear that the bar was not prepared for the event. The organizers reached a conclusion: there would be no reading. Instead, we were invited to a pub across the street for a drink on their dime. So we headed en masse across the street, had a drink, and then disbanded. But a few folks wanted to find dinner, so six of us—people I’d never met before—went to a Vietnamese fusion place not far away—and asked for a table. While we waited outside for the table to be ready, three of our group gave short readings on the sidewalk. So the reading happened after all. And then we had a pleasant dinner together. Bookfair. For me, the best part of AWP is the bookfair. Some years, when I’ve been actively submitting short stories to journals, I enjoy visiting their tables or booths and talking to editors. This year I was more interested in learning about small presses who might publish a novel manuscript I have available. I had even gone to the trouble of checking out these presses in advance and had made a list of the publishers I wanted to talk to and also the places I’d already submitted the book so I could follow up with them if they were in the fair. I printed the list out, and then forgot to bring it with me! But no matter, having done the work, I remembered most of what I needed to know. As a result, I had several productive discussions. Also I got to spend some time with the folks from Braddock Avenue Books who are bringing out my novel next year (in time for AWP in Portland) as well as my current publisher, Press 53 and visitors to their booth. I also bought a load of books and was also given a few books, making my suitcase way heavier for the trip home. As noted above, I have some concerns about AWP and wonder if the conference is still relevant to me. I’ve committed to attending next year in conjunction with the launch of my novel, but if it weren’t for that, I doubt that I would go. Thank you for the honest evaluation of the AWP conference. I had been feeling remiss for not going to any of those conferences. Why are the panels less relevant to you when the professionals presenting are women? I didn’t say the panels were less relevant. I said the conference–for all the factors mentioned–is feeling less relevant. In fact, though, a number of panels are designed to address topics that do only concern women–and none that I noticed that concern only men. Where the topics are of a more general nature, I’m happy to attend and learn, regardless of the makeup of the panel, but I have to wonder why men are excluded from such panel. Do we take diversity seriously or don’t we?